In this post we will talk about optimizing the Description Meta Tag and optimizing the description of the snippet of your blog in the search engine. First off, a little bit of theory. What is a snippet? 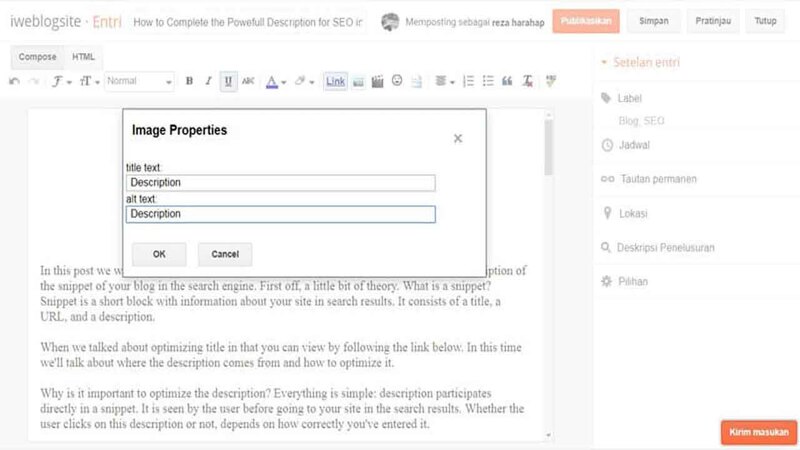 Snippet is a short block with information about your site in search results. It consists of a title, a URL, and a description. When we talked about optimizing title in that you can view by following the link below. In this time we'll talk about where the description comes from and how to optimize it. Why is it important to optimize the description? Everything is simple: description participates directly in a snippet. It is seen by the user before going to your site in the search results. Whether the user clicks on this description or not, depends on how correctly you've entered it. Accordingly, your description should be better than description of your competitors, so that if your site is in 3rd place and a competitor is at 1st, your site could receive more clicks. Let's have a simple test to understand where the descriptions come from. Let's look at the results page in Yandex and Google on the request website promotion in Moscow. And for the first 5 sites in the results in both search engines we examine where do the descriptions come from, to understand how are they formed. The first site: The description is taken from the content, i.e. different parts and different sentences of the text are taken from the page, search engine somehow combines it and shows the user. Often, such combinations look a little unnatural, but we will talk about it further. Next - the second site. The description is formed exactly the same way, only another H1 heading is taken. H1 and text. Search engine took them and placed in the description. Next - Description meta-rags, search engine took description directly from meta-tags. And the 5th site - description is again taken from the Yandex directory. How are things in Google: 1st site - description taken from the Description, 2nd - a combination of parts of content, 3rd site - a direct quote from the text, i.e. there are no combinations, 4th site - again the combination, and 5th site - Description meta-tags. What conclusions can be drawn from here? The fact that the Description is involved in Yandex in one case out of five, and in Google - in two cases out of five. That the description is most often taken from the content. Now we are talking directly about Description meta-tag. What are we going to do? We will take a description, which we'll make up, write and insert at the beginning of the text. But we will discuss it further. about 150 characters. Too little - the search engine will not take it into account and take to describe the snippet, too much - the search engine would cut it. Stick to about 150 characters. The description must be unique within the site and within the entire network. we write a unique description for each page: it should differ from other pages at least somehow. How to make a description attractive? We have a basic request on which we promote the page. And we look at context advertising regarding this issue - Direct and AdWords. Ads that are present on these requests have already been tested, have passed the test of time and are effective. We examine the used interesting ideas, killer features, and use these ideas. It is possible to combine even from several ads - take some interesting ideas and form an interesting description. It is important to make a description for people. to use correct spelling, cities and names of companies starting with a capital letter, correct sentence construction, not just listing of comma separated keywords, everything is simple. Description should describe the page. Not the entire site, but a specific page, talk about what is waiting for the user upon visiting the page. And make informative, short sentences. make the text not one big sentence, but break it down into a few short, informative sentences. It's easier to read. About the keywords: Description does not participate in ranking. Therefore, there is no need for spam, listing keywords. We insert keywords into the Description only to make them highlighted in the search results. What does it mean? A user types the request, your site is on the search engine results page, and if the description contains a keyword that he typed, it will be highlighted in bold, which would attract the attention of the user and increase CTR. What keys to take? We take the main keys, by which our page is promoted. If there are several keys, we can combine them into some readable sentence, or you can place different keywords in different sentences. And keywords should be in direct entry. Let's consider now the situation when the description for snippet is taken from the content. We have completed all the previous steps on writing and correct optimization of the Description meta-tag. What do we do? We take this description, insert it into the Description of the page and the same description is inserted at the beginning of our text - our content. It will make such a paragraph. it looks natural enough and contains nothing bad for SEO. But the search engine, it is proved in practice, picks it up well and shows on search, i.e. inserts our Description at the beginning of the text. You can also see what Description is used now, where the text comes from, if the text is taken from the page content, optimize this content, open it on the site and rewrite it. The most important thing among what I've said is analysis. Snippets should be constantly analysed. Monthly we check which snippets are displayed on the main key words of the main pages in both search engines. First of all, we look, what description is displayed in snippet, it is displayed correctly, is it normal? And if it appears abnormal, sentences are incorrectly constructed, the text is taken from the wrong place, we correct it. The same: open the page and edit the content, the part of the text that is taken in the description, edit according to our certain rules. It is convenient to keep chronology of snippets change in a table - a column with keys, a column wuth pages and by dates - citations of snippets: snippet, snippet, snippet. To see some dynamics of changes and whether our snippets are defined correct or wrong. If you still have questions about descriptions and snippets, feel free to ask them in the comments. Thank for visitng this How to Complete the Powefull Description for SEO in Blog Article's post.